More often than not the sports universe is filled to the brim with news that raises tempers. Should Pete Rose ever get a shot at The Hall? Does Mike Vick deserve redemption? Will the world move on without Brett Favre? Draw your lines in the sand and pick a side. That is exactly what we we are presented with all the time. I'm not innocent, believe you me. I do the same thing as every other sports medium. Part of me holds something against Roger Clemens. Terrell Owens name gets me fired up, and I should have known better upon his arrival in Big D. However, from time to time we all need to be reigned in and read or view something positive. This is my attempt to pay tribute or bring to light some stories we've neglected recently in our ever yearning for controversy. Tip O' The Cap to Jim Johnson Rest in peace Jim. The longtime Philadelphia Eagles defensive coordinator passed away today at the age of 68. When we think of the recent success of the Eagles many other names come to mind, Reid, McNabb, Dawkins, and or Westbrook. That is our mistake. Let us no longer make that mistake, the five appearances the Eagles made in the NFC Championship game from 2001-2009 are just as much Jim Johnson as anyone in that organization, if not more. Twenty-six (26) players on Jim Johnson's defense were sent to the Pro Bowl under his watch. The Eagles won five division titles in the NFL's toughest division, year in and year out. We really should be asking the Giants, 'Skins, and Cowboys about looking a Jim Johnson defense in the mouth. Brian Dawkins roaming the secondary. Hugh Douglas finding your blindside. Jeremiah Trotter staring over the middle. Sheldon Brown & Lito Shepperd putting fear in the the eyes of receivers and quarterbacks. Folks, that was a Jim Johnson defense. They are smarter and more dangerous than defenses we've seen in while. Under the radar was Jim Johnson, but today we give a Tip 'O The Cap to the legendary Eagles coordinator. 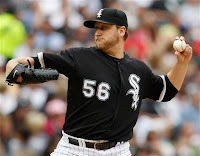 Tip O' The Cap to Mark Buehrle No one ever mentions the White Sox left hander alongside the likes of Halladay, Beckett, Lee and the rest of the American Leagues finest arms. How soon we forget. Mark Buehrle is a World Series Champion. Mark Buehrle has pitched a no-hitter. Mark Buehrle is amongst the elite pitchers which now boast a perfect game on their resume. Oh, and Tuesday night Buehrle set a major league record by continuing his perfect night and retiring the first 17 Minnesota Twins, giving him 45 straight batters shut down. No, we never mention Mark Buehrle come Cy Young season but if your a White Sox fan then you mention Mark Buehrle quite often. 8 of his 10 major league seasons, he's gone out and started 30+ games for the South Siders. During at least five seasons of his career Buehrle has gone out and won 16+ games including 19 in 2002, and he's well on his way to duplicating that. This 3x All-Star deserves to get some due and not just from our President (an avid Sox fan)Tip O' The Cap to the "quiet man" Mark Buehrle. Tip O' The Cap to Kevin Durant Praised by Coach Krzyzewski for his play during a recent Team USA mini-camp, Kevin Durant seems determined to not let another Olympics go by without him wearing the Red, White, & Blue. Would anyone blame Durant for being upset with the direction of the team which drafted him #2 overall just two years ago? He goes from becoming the poster boy of Seattle to abruptly being relocated in the middle of nowhere in Oklahoma City. Durant doesn't complain. In his second season he averaged more points and rebounds than he had in his rookie of the year campaign the previous year. Kevin Durant is proving to have staying power. Durant isn't the #1 pick and uses that as fire to launch him to ROY. Durant wears a jersey that reads Thunder, and subsequently bursts onto the NBA scene in his second year. Durant doesn't make the Redeem Team last summer only to return a year later and do everything but pen his name into the newest Olympic Team. Coach K is sending a message to the world: If Kevin Durant is making this his NBA Championship, the world better come hard or don't come at all. Tip O' The Cap to you Mr. Durant, you earn it. Now wasn't that more satisfying than 1,500 words on David Beckham being a massive tool? Good day.